One of the great things about going to the pub is that no two nights out are ever exactly the same. 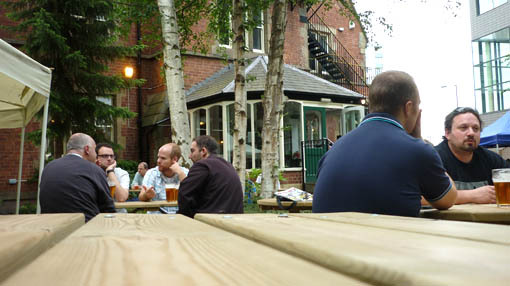 That’s what I say on Tuesday evening, in the serene garden of the University Arms (pictured below), where I’m being interviewed about this blog by a journalist from the Sheffield Star. It’s an observation that’s proved right on Saturday night, on a windswept building site in Birmingham city centre, where I’m asking a very drunk man from the Black Country, for the eleventh or twelfth time, to put his willy back in his pants as quickly as possible. More on that story later, as Kirsty would say. For now, the interview feels much less like an interview than meeting someone for a natter down the pub. Which is, well, strangely appropriate. The journo, Colin Drury, is a decent fella, and after the notepad is put away we score a second pint and chat about bands and things for a while instead. When you come across local journalists in real life, they’re just nice, normal people. This always comes as a pleasant surprise if you’re ever exposed to Eastenders, because in Eastenders, they’re snivelling, greasy, exploitative vermin. If you didn’t know better you’d think Eastenders is lazily scraped together crap that’s completely reliant on stereotypes. Where were we? We were in pubs. On Wednesday, to be specific, the Washington. I’m with my band. We’re playing our first hometown gig for nearly a year. I tend to tell people this is because Sheffield is big on horrible blokey indie rock, and we play pretty, sparkly indiepop. But there is also the fact that we haven’t sent anyone a demo CD. And the fact that we still think in terms of demo CDs instead of hyperlinks on the young people’s Facebook or whatever. The Washy is one of those pubs that Sheffield people speak of in slightly reverential tones. There are a few of these pubs dotted across the city. They used to be owned by one of The Human League, or one of Pulp used to go in there and do the Times crossword every lunchtime, or something like that. They might be a little weatherbeaten now, a little faded from their prime. But you go inside and the musical history somehow remains so palpable that you can breathe it in. So it seems a privilege to play at the Washy tonight, on our return to our home city. It’s an ideal venue in many ways, because it doesn’t take many people to make the Washington look full, and not many people is exactly how many people in Sheffield want to watch us play. For Friday Lunch Club it’s the Interval cafe bar on the university campus. I like the way university staff (hey, that’s me!) and students can mingle here pretty effortlessly. I also like the beer. One week there are great local brews from the likes of Spire and Abbeydale; today it’s Brewdog, whose excellent Edge mild ale is just the thing to sup and then go back to work without your head subsiding into your desk for most of the afternoon. And so, the following day, to Birmingham. There’s a food market on New Street today, and in many ways, Birmingham doesn’t change, because the first thing I see when I exit New Street station is an enormous piece of pork. In other ways, Birmingham does change, because there’s a half-decent pub there now. This is, of course, the Wellington (featured here; pictured above), and I’m here to meet my old chum Stu. Stu was my best mate for ages when I lived down here, but it’s been a job catching up since he moved to Belfast, so this is the first time I’ve seen him in about five years. We breathlessly catch up on football, families and future plans over some quick pints. These fall below the Wellington’s usual high standards. Stu’s Shackler’s Gold is good. And my third pint, the excellent Wyre Valley HPA, tastes like a fresh summer morning in a glass. But before it, both Oakham’s Citra pale ale and the Triple Hop brewed at Derby’s Brunswick Inn (featured here) arrive dull, flat and deflated. With conversation so animated and joyful, it’s a pity the beer is so languid and lifeless. From the back door of the Wellington, we cross an alleyway (pictured below) to the back door of the Old Joint Stock. The occasion is a stag night for our friend Chris, and we’re soon immersed in a group of folk who, like Stu, used to be among my closest mates but who I’ve not kept in touch with very effectively since I moved north. Delightfully, we ease into talk with not the merest hint of awkwardness, and the tone for the evening is set well. Three years ago the celebrated beer writer Roger Protz included the Old Joint Stock in his list of Britain’s 25 best pubs. The presence of, in particular, the Brunswick Inn and Coopers Tavern (featured here) gives the list credibility. But the Old Joint Stock is crap. One can only conclude that Roger was so bedazzled by the huge plate glass windows and spangly interior that he failed to notice the nondescript beer, appalling prices, and complete lack of bonhomie. It serves a decent pint of London Pride, but the Discovery is well below the standard set by Fuller’s pubs in the capital. And at four quid a pint, frankly, I’m going to be disappointed with any beer that doesn’t bring me close to metaphysical ecstasy. The Old Contemptibles is far more satisfying, and it’s a shame we don’t spend a little longer there instead of trooping off to the Jekyll & Hyde. After what seems like hours crowded into the back of the garden – partly so people can smoke, but partly because there’s nowhere to sit – a motion is carried to move on to St Paul’s Square. In a confusion of beer and Birmingham’s perpetual building site now enveloping St Chad’s Circus, three of us lose our way just a little. Suddenly it’s quiet and there’s no-one else around. We could be anywhere. And so it comes to pass that, having drunk too much too quickly, a member of our group who I’ve never met before tonight takes advantage of the desolation to empty his bladder. And, having emptied his bladder, opts to stand still, talking loudly and at great length about nothing in particular, instead of – as you might reasonably hope – putting his tackle away and continuing to the pub. Some time later we reach the Actress & Bishop, and it feels good to resume the catching up with my old friends. It’s a wonderful thing to spend a night in this way, in just the way we used to, every single Saturday for years. Closing time soon steals in, though. No sooner have we resorted to pints of freezing Guinness than glaring striplights flicker on and big-muscled grippers are urging us to sup up and sod off. Taxis swoop, goodnights are missed, and the evening is disintegrating entirely. It doesn’t quite matter. The pubs have been rubbish. But tonight goes to show that that needn’t mean a bad night, because the company’s been smashing. It’s an admirable skill, to be able to slag off pubs on your pub blog and still sound lyrical. Great post, Pete. Joe who used to work at the Welly now has (or runs) a pub in the Jewellery Quarter – The Brown Lion. Good selection of beer, good prices (change out of 9 quid for three pints), AND vegan food options. Fascinating insight into some of Birmingham’s ‘finest’ pubs. I live in Brum and have visited all of these pubs and not one of them is ‘great’, but you did identify the best being the Old Contemptibles. However, you hit the nail on the head with your final observation; it doesn’t matter how good the pubs are, nor how great the beer is (I’m a lager drinker!) the main thing is that if you’re with friends you can still have a great night out.